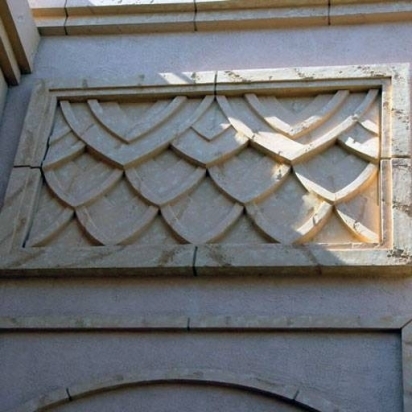 The intricate bas relief designs as seen on churches and places of worship are offered from Stromberg Architectural Products. As the producer of the world’s highest quality bas relief, Stromberg can fill orders of any size for your GFRC bas relief project. Bas relief is an easier type of relief to produce since less background has to be removed; therefore, GFRC (glass fiber reinforced concrete), is a perfect choice for this medium. GFRC lends itself well to the minute details in most bas relief designs. As embellishment for churches and other ecclesiastical settings, Stromberg’s GFRC bas relief can be seen today on church ceilings, altars and columns. Choose Stromberg for your bas relief projects. GFRC, a composite of cement, glass fibers, aggregates and polymers, is lighter than concrete and so is excellent for bas relief where weight would be an important consideration. Stromberg’s glass fiber reinforced concrete can be molded into any shape and is also available a wide variety of colors and textures. GFRC bas relief will add an ornate touch to any space. With their 30 years of experience, Stromberg can craft your bas relief project with skill… With Stromberg, you won’t pay for your initial estimate and consultation, and they’ll also provide installation services. They have custom products of both classical and modern available. Stromberg is the largest bas relief manufacturer in the world and you can be assured of products of the highest quality. You can choose Stromberg with confidence, knowing that they can fill any gfrc bas relief order of any size. They can also assist you in your design and in deciding on which details are just right for the development of your GFRC project. GFRC comes in several colors and finishes. Glass Fiber Reinforced Concrete is durable and weather resistant. Stromberg has the largest selection of classical and modern bas relief in the world. Stromberg can offer original custom designs in GFRC. The craftsmen at Stromberg Architectural Products will work closely with you on the details of your project to make sure your finished GFRC bas relief is accurate. Contact them today at (903) 454-0904 for a free quote, or email them.